EA Sports UFC 2 submissions can be a bit tricky. If you learn the basic skills to working the submission game, your overall ground game will improve. 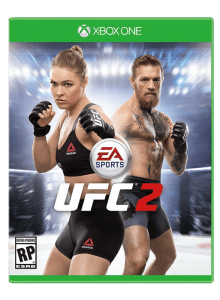 These four tips will help you master EA Sports UFC 2 submissions. The mini-game you are in is against the other fighter and not a game of chance. The defender needs “push” the middle line outwards to escape; whereas the attacker “blocks” these attempts. This is done my pressing one of the four different directions on the right analog stick ( up, down, left or right). The fighter doing the submission will have to watch and respond accordingly to block any attempted escapes. You will learn your opponent’s tendencies which will make this easier. As the attacker, in addition to blocking the escape attempts, you also have to pay attention for submission advancement opportunities. You will either be able to advance to the next stage in your current move, or move into a new submission via a chain which I will talk about next. The advancement with light up in either the up, down, left or right sections of the inner circle, and you need to flick that direction on the left analog stick to advance. You don’t have long to respond before it disappears so don’t miss it. Something important to lookout for on offense and defense are submissions chains. These will reduce the overall duration or stages of the submission hold, and potentially finish quicker. The option for a submission chain will always flash green on the inner circle, the same location as the advancement notification. When used, this will transition into a different submission hold, and is usually the last stage before “the tap.” This is why it is also important to be aware of this on defense to know if you are running out of time. Last but not least, don’t be intimidated by the submission game. It may be confusing at first, but once you learn the mechanics, you will panic a lot less when you see it coming. I’ve gotten out hard submissions by good players online by staying calm and focusing on the mechanic.